Potchefstroom - The Nashua Mobile Cape Cobras took full command of their Sunfoil Series match against the bizhub Highveld Lions at Senwes Park in Potchefstroom. Although they would have liked a few more wickets after keeping the Lions in the field for more than five sessions in hot weather, they finished the day 473 runs ahead. While the Lions did well to lose just a single wicket, their only realistic hope for the remaining two days is to play for the draw. Resuming on 322 for two wickets, the Cobras continued to bat steadily at over 3.5 runs to the over. Andrew Puttick took his overnight score from 166 to 194 before being dismissed in Imran Tahir’s first over of the day. Despite a mini-collapse, with three wickets falling in as many overs, Stiaan van Zyl and Dane Vilas made sure that the Lions could not restrict them to a score in the region of 400. After Van Zyl was caught trying to force the pace, Vilas found some partners down the order, Johann Louw in particular scoring 30 (56 balls) to take the Cobras past 500 before tea. Vilas resumed on 81 after the break, and moved into the 90s in partnership with Dane Piedt. However, he ended up stranded in sight of what would have been a ninth first-class century. First Piedt was trapped in front by Imran Tahir, his fifth wicket, and then, when Vilas could not get enough of the strike, Beuren Hendricks was also adjudged leg before to Pumelela Matshikwe in the next over. Vilas ended on 97 (138 balls, 11 fours). While he must have bitterly disappointed, he could be proud of his efforts for his adopted franchise against his former team-mates. Imran Tahir had the outstanding figures, collecting the 45th five-wicket haul of his career. 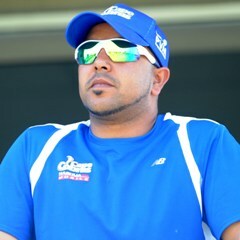 Matshikwe and Hardus Viljoen each claimed two wickets, but the Lions would have been disturbed to have conceded 42 extras. Exactly half of these were no-balls from Imran Tahir, who also could only bowl a single maiden over in his 47. The Lions got off to a brisk start. Stephen Cook and Quinton de Kock played breezily. The young left-hander was particularly punishing, taking seven boundaries off 40 balls before playing all around a Hendricks delivery. The fifty had come up earlier in just the thirteenth over. Cook and Zander de Bruyn had taken the total to 70 without further loss when the umpires took the players off the field due to bad light some twenty minutes before the scheduled close of play. The home team have a lot to do to reach safety, and can hardly have a thought of trying to force a victory. They need another 324 runs merely to avoid the follow-on. The pitch is still playing well, but there were hints of uneven bounce. Rory Kleinveldt was bowled trying to pull a short ball that kept low, and that will be at the back of their minds as they try to negotiate the last two days. The Cobras are still dominating the bonus points race, having earned 4.54 with the bat while the Lions could not earn a single bowling point.